Smart insulin pens are devices that are used to administer insulin for the treatment of diabetes. 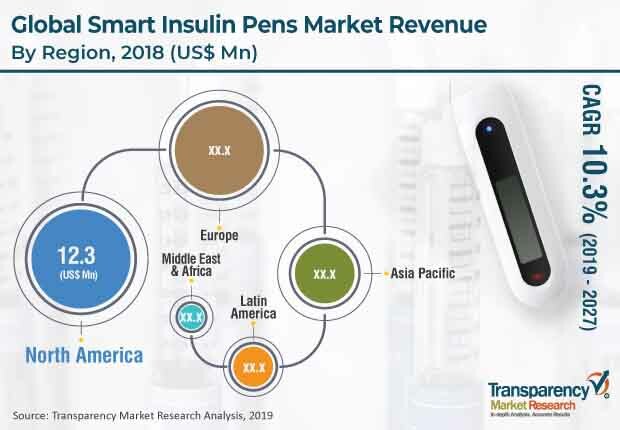 The global smart insulin pens market was valued at US$ 29.2 Mn in 2018 and is projected to reach US$ 70.4 Mn by 2027, expanding at a CAGR of 10.3% from 2019 to 2027. Rise in prevalence of diabetes in people of all ages and increase in awareness about chronic diseases, such as diabetes, is anticipated to drive the global market for smart insulin pens. Additionally, a surge in adoption of connected medical devices and integration of glucose monitoring devices and therapeutics for better management of diabetes is likely to propel the smart insulin pens market across the globe. According to World Health Organization, an estimated 1.6 million deaths occurred due to diabetes, in 2016. According to American Diabetes Association, in 2015, an estimated 30.3 million people in the U.S. had diabetes, among them 1.25 million were children. In terms of product, the smart insulin pens market has been categorized into smart insulin pens and adaptors for conventional pens. Based on connectivity type, the market has been classified into Bluetooth and USB. In terms of application, the market segmented into type 1 and type 2 diabetes. Based on distribution channel, the market has been divided into hospital pharmacy, online sales, retail pharmacy, and diabetes clinics/centers. In terms of region, the global smart insulin pens market has been segmented into North America, Europe, Asia Pacific, Latin America, and Middle East & Africa. North America accounted for a major share of the global market in 2018. The market in North America is driven by the presence of key players and a high rate of adoption of technologies in the region. Additionally, a rise in the prevalence of diabetes and new product launches and approval are likely to propel the market in the region. According to National Diabetes Statistics Report 2017, In the U.S., an estimated 30.3 million people had diabetes in 2015. According to Canadian Chronic Disease Surveillance System, there were estimated 3.0 million people in Canada are living with diabetes between 2013 and 2014. The market in Europe is driven by an increase in prevalence of diabetes. According to International Diabetes Federation, in 2017, approximately, 352 million people were at a risk of developing type 2 diabetes in Europe. The market in Asia Pacific is projected to expand at a rapid pace during the forecast period, due in an increase in the geriatric population with diabetes. The global smart insulin pens market is highly fragment, due to the presence of a large number of players. Major players operating in the global smart insulin pens market include Novo Nordisk A/S, Sanofi (sanofi-aventis US LLC), Eli Lilly and Company, Companion Medical, Emperra GmbH E-Health Technologies, Diabnext, Jiangsu Delfu medical device Co.,Ltd, BERLIN-CHEMIE, DIAMESCO CO., Ltd., and Patients Pending Ltd (Bigfoot Biomedical Inc.). In January 2018, BIOCORP received clearance in Europe for EASYLOG, an adaptor for insulin pens connected via the internet. This product approval enabled the company to strengthen its position in the market and enhance its product portfolio in Europe. In December 2017, Companion Medical launched the InPen, in the U.S. This product launch enabled the company to strengthen its diabetes management portfolio in the U.S. In August 2016, Emperra GmbH launched the ESYSTA BT Bluetooth Insulin Pen. This product launched enabled the company to strengthen the ESYSTA product portfolio. This report analyzes the current and future scenThis report analyzes the current and future scenario of the global smart insulin pens market. Increase in the prevalence of diabetes as well as rise in the demand for smart insulin pens due to their additional features are key factors that are anticipated to drive the global market.ario of the global smart insulin pens market. Increase in the prevalence of diabetes as well as rise in the demand for smart insulin pens due to their additional features are key factors that are anticipated to drive the global market. This report comprises an elaborate executive summary, which includes information about various segments of the global smart insulin pens market. It also provides information and data analysis of the global market with respect to the segments based on product, connectivity type, application, distribution channel, and region. A detailed qualitative analysis of drivers and restraints of the market and opportunities has been provided in the overview section. Additionally, the section comprises competitive matrix and company profiles along with business overview in order to understand the competitive landscape in the market. This section of the report also provides market attractiveness analysis by region and market share analysis by key players, thereby presenting a thorough analysis of the overall competitive scenario in the global smart insulin pens market. In terms of product, the global smart insulin pens market has been segmented into smart insulin pens and adaptors for conventional pens. In terms of connectivity type, the market can be has been divided into Bluetooth and USB. Based on application, the global market has been classified into type 1 and type 2 diabetes. In terms of distribution channel, the market has been segregated into hospital pharmacy, online sales, retail pharmacy, and diabetes clinics/centers. The market size and forecast for each of these segments have been provided for the period from 2017 to 2027, along with their respective CAGRs for the forecast period from 2019 to 2027, considering 2018 as the base year. In terms of region, the global smart insulin pens market has been segmented into North America (the U.S. and Canada), Europe (the U.K., Germany, France, Spain, Italy, and Rest of Europe), Asia Pacific (India, China, Japan, Australia & New Zealand, and Rest of Asia Pacific), Latin America (Brazil, Mexico, and Rest of Latin America), and Middle East & Africa (South Africa, GCC Countries, and Rest of Middle East & Africa). The market size and forecast for each of these regions and the mentioned countries/sub-regions have been provided for the period from 2017 to 20297 along with their respective CAGRs for the forecast period from 2019 to 2027, considering 2018 as the base year. The research study also covers the competitive scenario in these regions. The report also profiles major players in the global smart insulin pens market based on various attributes such as company overview, financial overview, product portfolio, business strategies, and recent developments. Major players profiled in the report include Novo Nordisk A/S, Sanofi (sanofi-aventis US LLC), Eli Lilly and Company, Companion Medical, Emperra GmbH E-Health Technologies, Diabnext, Jiangsu Delfu medical device Co.,Ltd, BERLIN-CHEMIE, DIAMESCO CO., Ltd., and Patients Pending Ltd (Bigfoot Biomedical Inc.).